Vadim Gluzman’s extraordinary artistry both sustains the great violinistic tradition of the 19th and 20th centuries and infuses it with the dynamism of today. He appears regularly around the world: with major orchestras such as the Chicago Symphony Orchestra, London Philharmonic Orchestra, Israel Philharmonic Orchestra, London Symphony Orchestra, Leipzig Gewandhaus Orchestra, San Francisco Symphony, Minnesota Orchestra and NHK Symphony Orchestra, and with leading conductors including Neeme Järvi, Michael Tilson Thomas, Andrew Litton, Itzhak Perlman, Paavo Järvi and Rafael Frühbeck de Burgos. Among his festival appearances are Verbier, Ravinia, Lockenhaus, Pablo Casals, Colmar, Jerusalem and the North Shore Chamber Music Festival in Northbrook, Illinois, founded by Gluzman with his wife and long-standing recital partner, the pianist Angela Yoffe. His wide repertoire embraces contemporary music, and Gluzman has given live and recorded premières of works by composers such as Giya Kancheli, Pēteris Vasks, Lera Auerbach and Sofia Gubaidulina. Accolades for his extensive discography on BIS Records include the Diapason d’Or of the Year, Gramophone Editor’s Choice, Choc de Classica, and Disc of the Month (Classic FM, Strad and BBC Music Magazines). 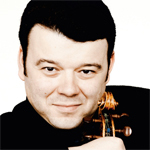 Born in the former Soviet Union, Vadim Gluzman began violin studies at the age of seven. Before moving to Israel in 1990, where he was a student of Yair Kless, he studied with Roman Šnē in Latvia and Zakhar Bron in Russia. In the USA his teachers were Arkady Fomin and, at the Juilliard School, the late Dorothy DeLay and Masao Kawasaki. Early in his career, he enjoyed the encouragement and support of Isaac Stern, and in 1994 he received the prestigious Henryk Szeryng Foundation Career Award. Vadim Gluzman plays the extraordinary 1690 ‘ex-Leopold Auer’ Stradivari, on extended loan to him through the generosity of the Stradivari Society of Chicago. For further information please visit Vadim Gluzman's webpage.